The majority of asthma exacerbations are caused by rhinovirus. Currently the treatment of asthma exacerbations is inadequate. Previous evidence suggests that macrolide antibiotics have anti-inflammatory and antiviral effects; however, the mechanism is unknown. We investigated the anti-rhinoviral potential of macrolides through the induction of antiviral gene mRNA and protein. Primary human bronchial epithelial cells were pre-treated with the macrolides azithromycin, erythromycin and telithromycin, and infected with minor-group rhinovirus 1B and major-group rhinovirus 16. The mRNA expression of the antiviral genes, type I interferon-β and type III interferon-λ1, interferon-λ2/3, and interferon-stimulated genes (retinoic acid inducible gene I, melanoma differentiation associated gene 5, oligoadenylate synthase, MxA and viperin) and pro-inflammatory cytokines (interleukin (IL)-6 and IL-8), and rhinovirus replication and release were measured. Azithromycin, but not erythromycin or telithromycin, significantly increased rhinovirus 1B- and rhinovirus 16-induced interferons and interferon-stimulated gene mRNA expression and protein production. Furthermore, azithromycin significantly reduced rhinovirus replication and release. Rhinovirus induced IL-6 and IL-8 protein and mRNA expression were not significantly reduced by azithromycin pre-treatment. In conclusion, the results demonstrate that azithromycin has anti-rhinoviral activity in bronchial epithelial cells and, during rhinovirus infection, increases the production of interferon-stimulated genes. Respiratory viral infections are associated with the majority of asthma exacerbations (∼80%) in both adults 1, 2 and children 3, 4. Asthma exacerbations are the major cause of morbidity, mortality and healthcare costs in asthma 5. The mechanisms of virus-induced asthma exacerbations are poorly understood 6. 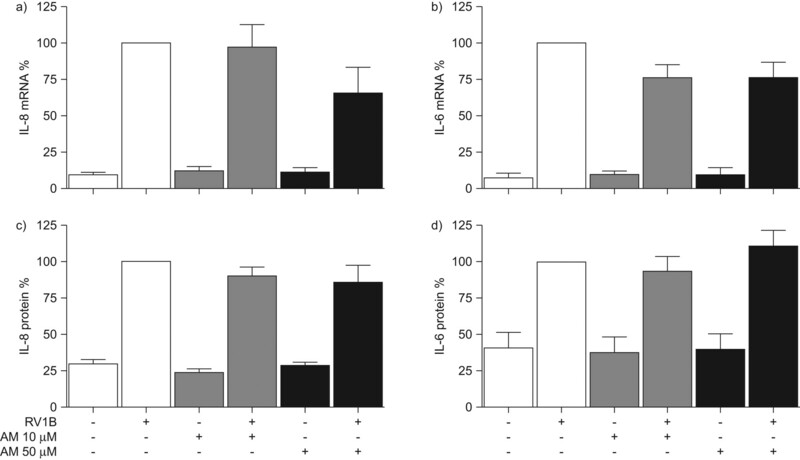 Inhaled corticosteroids reduce asthma exacerbation frequency 7–9; however, this effect is only partial even in combination with long-acting β2-agonists 10, 11, more effective therapies are therefore necessary. Rhinoviruses (RV) are responsible for ∼60% of virus-induced exacerbations 1, 4. Asthmatics have an increased susceptibility to RV infection compared with normal subjects 1. A novel mechanism for this increased susceptibility has been identified recently: asthmatics exhibit lower levels of interferon (IFN)-β and IFN-λ gene and protein expression upon RV infection 12, 13 and IFN-λ levels negatively correlate with exacerbation severity 13. Type I IFNs consist of the single gene IFN-β and numerous IFN-α. The recently discovered type III IFNs consist of IFN-λ1, 2 and 3 (respectively IL-29, IL-28A and IL-28B). The major IFNs produced by bronchial epithelial cells are IFN-β and -λ 14. Despite using different receptor complexes, both types of IFNs have functional similarities, including antiviral effects through stimulation of the innate and adaptive immune responses. After secretion, IFNs bind to the surface of infected and neighbouring cells to initiate the Janus-activated kinases (JAKs) and the signal transducers and activators of transcription (STATs). Activation of the JAK-STAT pathway leads to the induction of many IFN-stimulated genes (ISGs), which prevent viral replication, such as MxA 15, viperin 16 or the 2′–5′ oligoadenylate synthetase (OAS) family 17, and also recognise viral RNA, such as retinoic acid inducible gene (RIG)-I 18, and melanoma differentiation associated gene (MDA) 5 19. As asthmatics have defective IFN-β and IFN-λ expression, one potential approach to therapy of asthma exacerbations is to augment host IFN responses and induction of antiviral ISG expression. Macrolides include erythromycin (EM), azithromycin (AM) and the ketomacrolide telithromycin (Tel). They have well-established antibacterial 20 and anti-inflammatory effects 21–23, and preliminary evidence showed that they may also have antiviral effects 24–27. The antibacterial action of macrolides is through inhibition of protein synthesis via binding to the 50S subunit of bacterial ribosomes. Macrolides also inhibit interleukin (IL)-6 and IL-8 protein production and reduce neutrophil attraction to the site of infection, likely through inhibiting nuclear factor (NF)-κB 21, 28. Tel was reported to have a beneficial effect in treatment of asthma exacerbations, with Tel-treated patients experiencing greater improvements in lower airway symptoms and lung function compared with placebo-treated patients though the mechanisms of this therapeutic effect are unknown 29. In vitro studies report an anti-rhinoviral and anti-inflammatory effect of some macrolide antibiotics 24, 26, 27, possibly via a reduction of intercellular adhesion molecule (ICAM)-1 mRNA expression after major-group RV infection, which use ICAM-1 as their receptor. In contrast, antiviral effects were also observed for minor group RVs, which utilise a different receptor 26, 27. The mechanisms for this effect are therefore unknown. We hypothesised that the beneficial effects of macrolide antibiotics in asthma exacerbations may be due, at least in part, to their ability to exhibit antiviral activity. In the current study, we used in vitro models of normal primary human bronchial epithelial cell (HBEC) culture and investigated the effects of the macrolides AM, EM and Tel on IFN and ISG gene expression, ISG protein induction and also the antiviral activity during RV infection. HBECs (Lonza, Cleveland, OH, USA) were cultured in bronchial epithelial cell growth medium according to manufacturer's recommendations. RV1B and RV16 (ATCC, Rockville, IN, USA) were prepared as previously described 30, and were titrated on HeLa cells to ascertain their 50% tissue culture infective dose (TCID50) per mL 31. The identity of each virus was confirmed by inhibition with serotype-specific antibody using titration assays. Both viruses were negative for Mycoplasma infection. HBECs were cultured in 12-well tissue culture plates (Nunc, Rochester, NY, USA) until 80–90% confluent before being treated with AM, EM (Sigma-Aldrich, St Louis, MA, USA), and Tel (a kind gift from Sanofi Aventis, Guildford, UK) at a concentration of 10 μM or 50 μM in bronchial epithelial basal medium (BEBM) for 24h. The diluent used for all three macrolides was 96% ethanol, at a final concentration of 0.05% for 50 μM macrolides and was confirmed in preliminary experiments not to have any effect on measured outcomes (data not shown). HBECs were then infected with RV1B, at multiplicity of infection (MOI) 1 or 0.25, or RV16 (MOI of 1) for 1 h with shaking at room temperature and replaced with 1 mL of BEBM. After 8, 24 and 48 h, supernatants and cells were harvested in RLT-buffer (Qiagen, Crawley, UK) for RNA isolation, or in 2% Tris-glycine SDS sample buffer (Invitrogen, Paisley, UK) for protein. Supernatants and lysates were stored at -80°C until analysis. Total RNA isolation was performed using RNeasy® mini kit (Qiagen) according to the manufacturer's recommendations. cDNA was prepared using random primers (Promega, Maddison, WI, USA) and Omniscript RT kit (Qiagen) according to manufacturers' recommendations and stored at -80°C. In a 25-μL PCR reaction, 2 μL cDNA was amplified in a 7500 Sequence Detector, using the 2× QuantiTect Probe PCR Master Mix (Qiagen), 50 nM forward primer, 300 nM reverse primer and 100 nM probe were used for RV, 300 nM primers and 100 nM probe were used for the 18S rRNA internal control, 300 nM forward primer, 900 nM reverse primer and 100nM probe for oligoadenylate synthetase (OAS), IL-29 and IFN-β, and 900 nM primers and 100 nM probes for myxovirus resistance A (MxA), viperin, IL-28, IL-6, IL-8, retinoic acid-inducible gene (RIG)-I and melanoma differentiation associated gene (MDA)5 (all FAM-TAMRA labelled). Sequences of primers and probes used are listed in table 1. The copy numbers were determined via standard curves of each gene constructed as dsDNA plasmids and normalised with the housekeeping gene 18S rRNA. Data are presented as percentage of copy number of control wells (RV1B), from ∼2.5×105 cells·well−1. IL-6 and IL-8 were quantified by ELISA using commercially available paired antibodies and standards, following the manufacturer's instructions (R&D Systems, Abingdon, UK). The sensitivity of each assay was 10 pg·mL−1. Total protein lysates were run on 4–12% Bis-Tris polyacrylamide gels, and transferred onto nitrocellulose membranes (Invitrogen), blocked in 5% skimmed milk, and probed with antibodies specific for human RIG-I 0.083 μg·mL−1 (Cell Signaling, Danvers, MA, USA), RSAD2/viperin 0.3 μg·mL−1 (ProteinTech Group, Chicago, IL, USA), OAS1 0.5 μg·mL−1 (Abgent, San Diego, CA, USA), MxA 0.2 μg·mL−1 (Santa Cruz Biotechnology, Inc., Santa Cruz, CA, USA) or α-tubulin 0.2 μg·mL−1 (Santa Cruz Biotechnology, Inc.). Secondary antibodies used were goat anti-mouse horseradish peroxidise (HRP) conjugate 0.08 μg·mL−1 and sheep anti-rabbit HRP conjugate 2 μg·mL−1 (AbD Serotec, Oxford, UK). Blots were developed using ECL (GE Healthcare, Chalfont St Giles, UK). Supernatants were serially diluted in DMEM containing 4% fetal calf serum (Invitrogen) and titrated on HeLa cells to determine the TCID50·mL−1 of the RV in the supernatants. Each dilution was assayed in eight replicates, and TCID50·mL−1 was calculated according to the Spearman–Karber formula 31. All data are presented as mean±sem. Comparisons of different groups were analysed using ANOVA with Bonferroni post-testing (Prism, GraphPad Software, San Diego, CA, USA). A p-value <0.05 was considered significant. All experimental work was performed as 3–5 independent experiments. At 8 h after infection, RV1B (MOI 0.25) significantly induced IL-28 mRNA expression (p<0.01, data not shown) and at MOI 1 there was a significant induction of IL-28, MxA, RIG-I, MDA-5 (p<0.05) and OAS (p<0.01) compared with medium-treated cells (data not shown). At 24 h after infection, RV1B significantly induced type I and type III IFNs and the ISGs measured at both RV1B concentrations compared with medium-treated cells. RV1B increased IFN-β mRNA levels from 8.9×103 (±4.4×103) copy number per 2.5×105 cells to 1.6×105 (±6.2×104, p<0.05) at MOI 0.25 and to 5.6×105 (±2.1×105, p<0.05) at MOI 1; IL-28 from 1.3×101 (±1.1×101) to 1.1×105 (±4.3×104, p<0.05) at MOI 0.25 and to 5.6×105 (±3.0×105, p<0.05) at MOI 1; and IL-29 mRNA from 1.6×101 (±0.6×100) to 3.2×103 (±6.9×102, p<0.05) at MOI 0.25 and to 5.2×106 (±3.3×104, p<0.05) at MOI 1 24 h post-infection. ISG mRNA levels were also significantly increased by RV1B 24h post-infection; viperin was increased from 2.5×101 (±2.3×101) copy number per 2.5×105 cells to 9.2×105 (±4.4×105, p<0.05) at MOI 0.25 and to 1.2×106 (±3.9×105, p<0.05) at MOI 1; MxA from 1.1×104 (±1.4×103) to 3.5×106 (±1.4×106, p<0.05) at MOI 0.25 and to 3.7×106 (±1.3×106, p<0.05) at MOI 1; OAS from 1.8×105 (±4.4×104) to 4.3×106 (±1.3×106, p<0.01) at MOI 0.25 and 4.0×106 (±1.2×106, p<0.01) at MOI 1; RIG-I from 2.0×105 (±4.7×104) to 1.5×106 (±4.7×105, p<0.05) at MOI 0.25 and 3.2×106 (±1.1×106, p<0.05) at MOI 1; and MDA5 from 3.2×104 (±6.7×103) to 2.5×105 (±8.0×104, p<0.05) at MOI 0.25 and 2.8×105 (±6.8×104, p<0.01) at MOI 1. RV1B (MOI 1 and 0.25; fig. 1) induced type I and type III IFN and the effects of AM, EM and Tel pre-treatment on this were determined using real-time PCR. RV1B infection increased type I and type III IFN mRNA expression in HBECs 24 h post-infection. RV1B (MOI 1) induced IFN-β (fig. 1a), IL-28 (fig. 1b) and IL-29 (fig. 1c) mRNA expression was nonsignificantly increased by 10 μM and 50 μM AM compared with RV1B infected cells. RV1B (MOI 0.25) induced IFN-β (fig. 1d), IL-28 (fig. 1e) and IL-29 (fig. 1f) mRNA expression and this was nonsignificantly increased with 10 μM AM and significantly increased with 50 μM AM (p<0.05) compared with control (RV1B-infected cells). The effects of EM and Tel on RV-induced type I and type III IFN mRNA expression were also investigated but neither macrolide had any significant effect on RV1B-induced IFN or ISGs (data not shown). Azithromycin (AM) increased minor-group rhinovirus (RV) 1B-induced interferon (IFN) gene expression. Human bronchial epithelial cells were pre-treated with AM or medium for 24 h and infected with a, b, c) RV1B at a multiplicity of infection (MOI) 1 or d, e, f) MOI 0.25, or treated with medium. AM- and RV1B-induced mRNA levels of a, d) IFN-β, b, e) interleukin (IL)-28 and c, f) IL-29 were measured by real-time PCR at 24 h post-infection and data are presented as % expression relative to infected control (i.e. RV1B-infected cells, n = 5). *: p<0.05. RV1B (MOI 1 and 0.25; figs 2 and 3, respectively) induced ISG mRNA and the effects of AM, EM and Tel pre-treatment on this were determined using real-time PCR. RV1B (MOI 1) induced ISG mRNA expression was increased by AM at a concentration of 10 μM and 50 μM at 24 h post-infection and RIG-I (fig. 2a), OAS (fig. 2c), viperin (fig. 2d) and MxA (fig. 2e) mRNA expression were nonsignificantly increased by 10 μM and significantly increased by 50 μM AM (p<0.01, p<0.001, p<0.01 and p<0.05, respectively) compared with control (RV1B MOI 1). MDA5 mRNA expression was nonsignificantly increased by 10 μM and 50 μM AM compared with control (RV1B MOI 1; fig. 2b). To confirm the effects of AM on ISG mRNA, using western blotting, RV1B (MOI 1, fig. 4) induced ISG protein and the effects of AM on this were determined. RV1B-induced viperin, RIG-I, OAS and MxA protein were further increased by AM in a dose-dependent manner. AM did not induce any of these ISGs when administered alone (fig. 2f). The cytoskeletal protein α-tubulin was used as load control. RV1B (MOI 0.25) induced ISG mRNA expression was increased by AM at a concentration of 10 μM and 50 μM at 24 h post-infection and RIG-I (fig. 3a), OAS (fig. 3c), viperin (fig. 3d) and MxA (fig. 3e) mRNA expression were nonsignificantly increased by 10 μM and significantly increased by 50 μM AM (p<0.01, p<0.001 and p<0.01, respectively) compared with control (RV1B MOI 0.25). 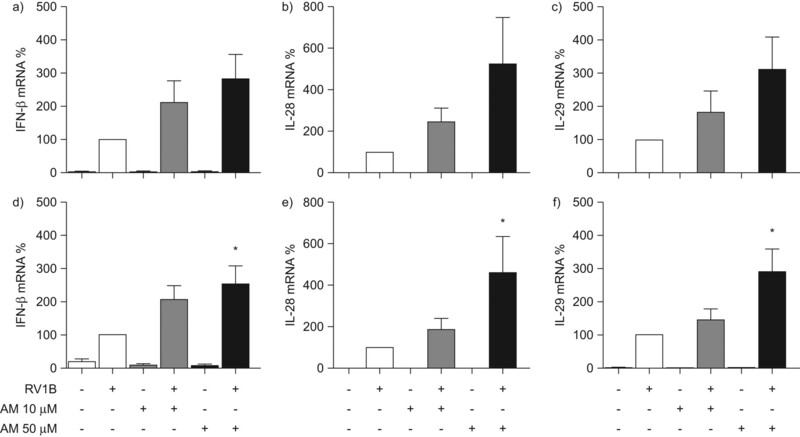 MDA5 mRNA expression was nonsignificantly increased by 10 μM AM and 50 μM AM compared with control (RV1B; fig. 3b). The effects of EM and Tel on RV-induced ISG mRNA expression were also investigated but neither macrolide had any significant effect (data not shown). Azithromycin (AM) increased high-dose rhinovirus (RV) 1B-induced interferon-stimulated genes (ISGs). Human bronchial epithelial cells (HBECs) were pre-treated with AM or medium for 24 h and infected with RV1B multiplicity of infection 1 or treated with medium. 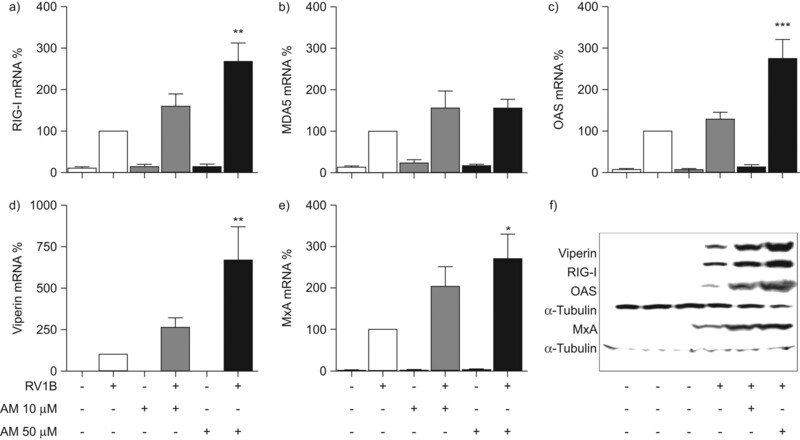 AM and RV1B-induced mRNA levels of a) retinoic acid inducible gene (RIG)-I, b) melanoma differentiation associated gene (MDA) 5, c) oligoadenylate synthetase (OAS), d) viperin and e) myxovirus resistance A (MxA), measured by real-time PCR at 24 h post-infection and data are presented as % expression relative to control (RV1B-infected cells, n = 5). f) Both 10 and 50 μM AM increased RV1B-induced ISG protein in HBECs compared with RV1B-infected cells (representative of three independent experiments). **: p<0.01; ***: p<0.001. Azithromycin (AM) increased low-dose rhinovirus (RV) 1B-induced interferon-stimulated genes. Human bronchial epithelial cells were pre-treated with AM or medium for 24 h and infected with RV1B at a multiplicity of infection (MOI) 0.25 or treated with medium. AM and RV1B-induced mRNA levels of a) retinoic acid inducible gene (RIG)-I, b) melanoma differentiation associated gene (MDA) 5, c) oligoadenylate synthetase (OAS), d) viperin and e) myxovirus resistance A (MxA), measured by real-time PCR at 24 h post-infection (n = 5) and data are presented as % expression relative to control. **: p<0.01; ***: p<0.001. Azithromycin (AM) increased major-group rhinovirus (RV)-induced interferon (IFN)-stimulated genes (ISGs). Human bronchial epithelial cells (HBECs) were pre-treated with AM or medium for 24 h and infected with RV16 at a multiplicity of infection 1 or treated with medium. AM and RV1B-induced mRNA levels of a) IFN-β, b) myxovirus resistance A (MxA) and c) viperin were measured by real-time PCR at 24 h post-infection (n = 5) and data are presented as % expression relative to RV16-infected cells. d) Both 10 and 50 μM AM increased RV16-induced ISG protein in HBECs compared with RV16 infected cells (figure is representative of three experiments). *: p<0.05; **: p<0.01. HBECs were also infected with major-group RV16 following pre-treatment with AM. Figure 4 shows that RV16-induced IFN-β (fig. 4a), MxA (fig. 4b) and viperin (fig. 4c) was enhanced by 10 μM AM and significantly augmented with 50 μM AM (p<0.05, p<0.05, p<0.01 versus RV16 control, respectively). To confirm the effects of AM on ISG induction, RV16-induced ISG protein and the effects of AM on this were determined by western blot. 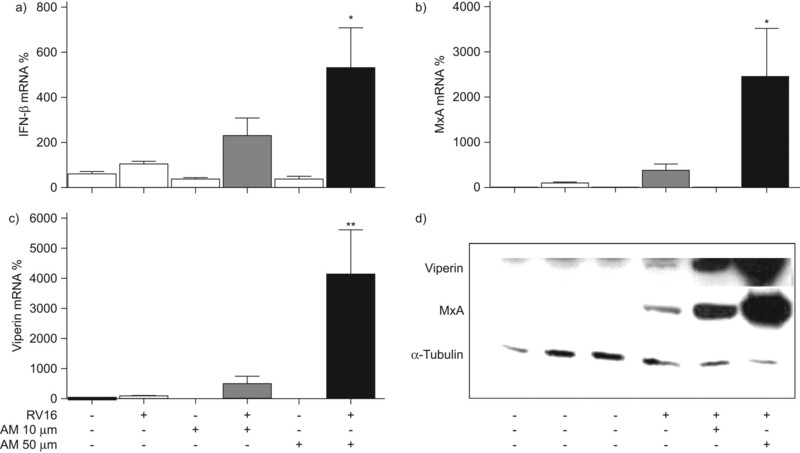 RV16-induced viperin and MxA protein were further increased by AM in a dose-dependent manner. AM did not induce any of these ISGs when administered alone. The cytoskeletal protein α-tubulin was used as a load control. (fig. 4d). The effects of AM, EM and Tel on RV1B-induced IL-6 and IL-8 mRNA levels were determined by real-time PCR and RV1B-induced IL-8 and IL-6 protein levels were determined by ELISA (fig. 5). AM reduced IL-6 and IL-8 mRNA expression and protein levels modestly but not statistically significantly at either concentration at 24 h post-infection (fig. 5). The effects of EM and Tel on RV1B-induced IL-8 and IL-6 mRNA were also investigated but neither macrolide had any significant effect (data not shown). Azithromycin (AM) had no effect on rhinovirus (RV)-induced pro-inflammatory cytokines. Human bronchial epithelial cells (HBECs) were pre-treated with AM or medium for 24 h and infected with RV1B at a multiplicity of infection 1 or treated with medium. AM and RV1B at a concentration of either 10 or 50 μM did not significantly increase RV1B-induced a) interleukin (IL)-8 mRNA, b) IL-6 mRNA, as measured by real-time PCR at 24 h post-infection, or c) IL-8 protein or d) IL-6 protein as measured by ELISA at 24 h post-infection compared with control (RV1B infected cells, n = 5). The effects of AM, EM and Tel on RV1B and RV16 release and RNA was measured using a virus titration assay and quantitative PCR for viral RNA. RV1B RNA (fig. 6a) at 24 h and 48 h post-infection was nonsignificantly reduced by 10 μM AM and significantly reduced by 50 μM AM (p<0.001). At 48 h post-infection, 10 μM AM also significantly reduced RV1B RNA abundance (p<0.001). Furthermore, the reduction by 50 μM AM was significantly more than by 10 μM AM (p<0.001). RV1B release (fig. 6c) was significantly reduced by 50 μM AM at 24 h (p<0.05) and 48 h (p<0.001). AM at a concentration of 10 μM had no significant effect on RV1B release. RV16 RNA abundance was significantly decreased by 50 μM AM at 24 h (p<0.01; fig. 6b). RV16 RNA at 48 h was also decreased by AM, significantly by 50 μM AM (p<0.001; fig. 6b). RV16 release was not affected at 24 h post-infection; however, it was significantly affected using AM at 50 μM (p<0.05; fig. 6d). The effects of EM and Tel on RV1B release and replication were also investigated but neither macrolide had any significant effect on RV replication (data not shown). Azithromycin (AM) reduced rhinovirus (RV) 1B and RV16 replication. Human bronchial epithelial cells were pre-treated with AM or medium for 24 h and infected with RV1B or RV16 at a multiplicity of infection 1. a) At a concentration of 50 μM, AM decreased RV1B RNA at 24 h, and also with 10 and 50 μM at 48 h post-infection, as assessed by real-time PCR. b) At a concentration of 50 μM, AM decreased RV16 RNA at 24 h, and also with 50 μM at 48 h post-infection, as assessed by real-time PCR. c) AM at a concentration of 50 μM reduced RV1B release at 24 h and 48 h (n = 8). d) AM at a concentration of 50 μM reduced RV16 release at 48 h (n = 5). Data are presented as % relative to control. *: p<0.05; **: p<0.01; ***: p<0.001. The current treatment of asthma consists of corticosteroids and/or β2-agonists and only partially prevents asthma exacerbations. A vital need exists for new treatment regimes for this form of asthma. Macrolide antibiotics have anti-inflammatory activity and possibly antiviral activity in airway epithelial cell lines 24, 26, 27, although the exact a mechanism of this is unclear. In our study, AM, but not EM or Tel, increased RV-induced IFN and ISG responses and reduced RV replication and release in HBECs. The macrolides had no anti-inflammatory effect. Several macrolide antibiotics have anti-inflammatory effects, demonstrated by inhibition of the production of pro-inflammatory cytokines in vitro 22, 24–28, 32. This effect occurs via suppression of NF-κB activation in HBECs 22, 24, 32. Reduction of cytokines, such as IL-6 and IL-8 can be an advantageous mechanism that leads to attenuation of airway inflammation. Other studies have reported anti-inflammatory activity of clarithromycin, bafilomycin A1 and EM on major-group RV infection, and minor-group RV infection for EM, in airway epithelial cells showing reduction of RV induced pro-inflammatory cytokines 24, 26, 27. In the present study, we showed no significant reduction of RV1B-induced IL-6 and IL-8 mRNA and protein by AM, EM or Tel. These data question the anti-inflammatory potential of macrolides and the mechanism of this in bronchial epithelial cells. The conflicting results observed in studies with various macrolides may be explained by differences in the experimental model. In the present study, using primary bronchial epithelial cells, we used shorter incubation times with the macrolides and sampled at 24–48 h post-RV infection, as primary bronchial epithelial cells are more susceptible to RV infection than cell lines, requiring a shorter duration of experimentation. The reduction of RV-induced anti-inflammatory cytokines previously observed by macrolides is also modest, at best. The reduction of pro-inflammatory molecules by macrolides in micromolar concentrations range from 80 to 25% 24, 26, 27. In contrast, corticosteroids reduce RV-induced pro-inflammatory cytokine production by 70–85% in bronchial epithelial cells using nanomolar concentrations 33. Therefore, the anti-inflammatory effects observed with macrolides are modest if compared to the anti-inflammatory effects of corticosteroids and require much higher doses, questioning their real use as anti-inflammatory agents. A possible mechanism of anti-RV activity of macrolides has been demonstrated as reduction of ICAM-1, the receptor of major group RVs. However, the anti-RV effects of macrolides cannot be completely explained by this. A range of studies have suggested that macrolides inhibit replication of both major and minor groups of RV 24, 26, 27. Furthermore, a study by Suzuki et al. 27 observed anti-viral effects of EM on minor group RV2, but no reduction in the low-density lipoprotein receptor, the receptor for minor group RV. Our study further supports that the anti-viral effects of macrolides are not completely dependent on reduction of ICAM-1, as our results show suppression of viral replication with minor-group RV1B and major-group RV16, which therefore cannot be explained by reduction of the major group RV receptor, ICAM-1. In our studies, AM reduced RV1B and RV16 replication and release into supernatants, and increased ISG gene and protein expression. The ISGs studied have been shown to have antiviral activity. Recently viperin, one of the RV-induced ISGs increased by AM, is required for the host defence against RV infection in HBECs 34. The antiviral role for the other ISGs investigated in the present study have not been yet established to have rhinoviral activity in bronchial epithelial cells, yet are well established in other viral infections 35, 36. AM also induced the mRNA and protein of the important intracellular dsRNA and ssRNA pattern recognition molecules, RIG-I and MDA5, required for IFN-β induction 18. Hence, not only are macrolides responsible for direct induction of antiviral genes, but they also upregulate the sensors of viral infection. This may be desirable for use as a therapeutic treatment given shortly after viral infection, whereby macrolides, if given topically to the airway during viral infection, could potentially increase the number of sensory molecules ready to detect and respond to replicating viral nucleic acid. We found that the macrolides did not induce antiviral genes by themselves. Currently we do not understand the mechanism of how AM induces anti-viral activity in the presence of RV infection. Antiviral ISGs can be induced via IRF transcription factors following virus infection 37. One possible mechanism of AM could be activation of signalling pathways including IκB-kinase (IKK)-β 38, IKK-ι/ϵ 37 and TBK-1 39, producing interferon-regulatory factor (IRF) activation. Alternatively, macrolides may act via the type I IFN receptor complex (IFNAR1), inducing IRF9, IRF7 and STAT1/2, producing the transcription factor ISGF3 40, 41. AM could, in theory, act on the IFNAR1 complex, or the receptor complex for IL-29 and IL-28 42. In vivo studies of macrolides have shown contradictory results. Clarythromycin had no effect on the development of cold symptoms and nasal inflammation In contrast, the TELICAST (telithromycin in acute exacerbations of asthma) study demonstrated the potential benefits of the macrolide antibiotic Tel in the treatment of asthma exacerbations 29. Whether the success of the TELICAST study was in part due to antiviral activity is unknown. Interestingly, we found no antiviral activity of Tel in vitro, suggesting that the positive effect of Tel in asthma exacerbations is either unrelated to virus infection or through antiviral properties in other cell types and different immune responses during infection. These data demonstrate that, although studies in cell lines are important and useful in defining mechanisms, results need to be confirmed in vivo. A similar study examining the effects of AM as a treatment for asthma exacerbations would therefore be appealing. In summary, we present a possible new mechanism of anti-rhinoviral activity of macrolides in HBECs. This is the first study showing antiviral effects of macrolides in primary HBECs, which is the site of infection of RV in vivo and therefore important in rhinovirus induced asthma exacerbations 43, 44. While only modest, the upregulation of IFNs and ISGs and suppression of RV replication may have consequences on asthma exacerbations and may further explain the antiviral effects seen in previous studies. The importance and protective role of IFN-β and IFN-λ in asthma exacerbations have recently been shown 12, 13, and epidemiological studies have provided a model of the disease burden associated with RV-induced asthma exacerbations. Whether the antiviral effects of AM can be used as a therapeutic treatment for asthma exacerbations requires further study in appropriate animal and human models. We thank Sanofi-Aventis (Guildford, UK) for supplying telithromycin.
. Frequency, severity, and duration of rhinovirus infections in asthmatic and non-asthmatic individuals: a longitudinal cohort study. Lancet 2002; 359: 831–834.
. Interleukin-10 gene expression in acute virus-induced asthma. Am J Respir Crit Care Med 2005; 172: 433–439.
. Personal exposure to nitrogen dioxide (NO2) and the severity of virus-induced asthma in children. Lancet 2003; 361: 1939–1944.
. Community study of role of viral infections in exacerbations of asthma in 9–11 year old children. BMJ 1995; 310: 1225–1229.
. Asthma exacerbations. 1: epidemiology. Thorax 2006; 61: 722–728.
. Asthma exacerbations. 3: Pathogenesis. Thorax 2006; 61: 909–915.
. Doubling the dose of budesonide versus maintenance treatment in asthma exacerbations. Thorax 2004; 59: 550–556.
. Study of modifiable risk factors for asthma exacerbations: virus infection and allergen exposure increase the risk of asthma hospital admissions in children. Thorax 2006; 61: 376–382.
. Budesonide/formoterol combination therapy as both maintenance and reliever medication in asthma. Am J Respir Crit Care Med 2005; 171: 129–136.
. Effect of inhaled formoterol and budesonide on exacerbations of asthma. Formoterol and Corticosteroids Establishing Therapy (FACET) International Study Group. N Engl J Med 1997; 337: 1405–1411.
. Role of deficient type III interferon-λ production in asthma exacerbations. Nat Med 2006; 12: 1023–1026.
. Respiratory virus induction of α-, β- and λ-interferons in bronchial epithelial cells and peripheral blood mononuclear cells. Allergy 2009; 64: 375–386.
. Interferon-induced human protein with homology to protein Mx of influenza virus-resistant mice. Mol Cell Biol 1985; 5: 2150–2153.
. Viperin (cig5), an IFN-inducible antiviral protein directly induced by human cytomegalovirus. Proc Natl Acad Sci USA 2001; 98: 15125–15130.
. Interferon-induced and double-stranded RNA-activated enzymes: a specific protein kinase and 2′, 5′-oligoadenylate synthetases. J Interferon Res 1991; 11: 199–205.
. The RNA helicase RIG-I has an essential function in double-stranded RNA-induced innate antiviral responses. Nat Immunol 2004; 5: 730–737.
. MDA-5: an interferon-inducible putative RNA helicase with double-stranded RNA-dependent ATPase activity and melanoma growth-suppressive properties. Proc Natl Acad Sci USA 2002; 99: 637–642.
. Inhibition of polypeptide synthesis in cell-free systems by virginiamycin S and erythromycin. Evidence for a common mode of action of type B synergimycins and 14-membered macrolides. Biochim Biophys Acta 1988; 949: 71–78.
. Erythromycin suppresses interleukin 6 expression by human bronchial epithelial cells: a potential mechanism of its anti-inflammatory action. Biochem Biophys Res Commun 1995; 210: 781–786.
. Erythromycin modulates IL-8 expression in normal and inflamed human bronchial epithelial cells. Am J Respir Crit Care Med 1997; 156: 266–271.
. Macrolide antibiotics protect against endotoxin-induced vascular leakage and neutrophil accumulation in rat trachea. Antimicrob Agents Chemother 1994; 38: 1641–1643.
. Effect of erythromycin on Haemophilus influenzae endotoxin-induced release of IL-6, IL-8 and sICAM-1 by cultured human bronchial epithelial cells. Eur Respir J 1995; 8: 1451–1457.
. Erythromycin inhibits rhinovirus infection in cultured human tracheal epithelial cells. Am J Respir Crit Care Med 2002; 165: 1113–1118.
. Erythromycin suppresses nuclear factor-κB and activator protein-1 activation in human bronchial epithelial cells. Biochem Biophys Res Commun 2000; 267: 124–128.
. The effect of telithromycin in acute exacerbations of asthma. N Engl J Med 2006; 354: 1589–1600.
. Corticosteroids and β2 agonists differentially regulate rhinovirus-induced interleukin-6 via distinct cis-acting elements. J Biol Chem 2007; 282: 15366–15375.
. Gene expression profiles during in vivo human rhinovirus infection: insights into the host response. Am J Respir Crit Care Med 2008; 178: 926–968.
. Interferon, Mx, and viral countermeasures. Cytokine Growth Factor Rev 2007; 18: 425–433.
. The 2-5A system in viral infection and apoptosis. Biomed Pharmacother 1998; 52: 386–390.
. Identification of Ser-386 of interferon regulatory factor 3 as critical target for inducible phosphorylation that determines activation. J Biol Chem 2004; 279: 9698–9702.
. JNK2 and IKKβ are required for activating the innate response to viral infection. Immunity 1999; 11: 721–731.
. IFN-regulatory factor 3-dependent gene expression is defective in Tbk1-deficient mouse embryonic fibroblasts. Proc Natl Acad Sci USA 2004; 101: 233–238.
. The interferon-inducible Stat2:Stat1 heterodimer preferentially binds in vitro to a consensus element found in the promoters of a subset of interferon-stimulated genes. J Interferon Cytokine Res 2001; 21: 379–388.
. Regulation of IFN-α/β genes: evidence for a dual function of the transcription factor complex ISGF3 in the production and action of IFN-α/β. Genes Cells 1996; 1: 995–1005.
. IFN-λs mediate antiviral protection through a distinct class II cytokine receptor complex. Nat Immunol 2003; 4: 69–77.
. Rhinovirus-16 colds in healthy and in asthmatic subjects: similar changes in upper and lower airways. Am J Respir Crit Care Med 1999; 160: 100–108.